Whatever the activity or the item, we have the perfect storage fixture for your children. We carry a wide-range of storage shelves and bookcases complete with removable bins to help keep all your preschooler’s things in order. 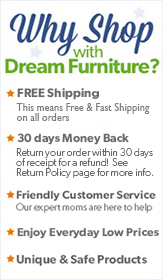 For your child’s play area, DreamFurniture.com specializes in toy chests and toy boxes, bookcases large and small, arts & craft furniture, and storage cabinets. We even have changing tables for your littlest, and bookcases and storage units for your oldest. We have everything to meet your storage needs from books to toys to collectibles anything you can imagine!